Of course, the National Mall starts off our list -- how could it not? With the perfect patriotic backdrop, the Mall is dishing up a day of patriotic events. Smithsonian Folklife Festival: National Mall between 3rd and 4th streets NW, 11 a.m.-5:30 p.m. The annual Smithsonian Folklife Festival highlights different cultures each year. This time, it's putting Peru in the spotlight, featuring food, music, vendors, demonstrations and more. National Independence Day Parade: Constitution Avenue NW from 7th to 17th streets NW, 11:45 a.m.-2 p.m. Watch as marching bands, fife and drum corps, floats, military units and more parade down Constitution to celebrate America. United States Air Force Band Concert: Sylvan Theater, Washington Monument Grounds, 6-9:09 p.m. Max Impact, billed as the U.S. Air Force Band's premiere rock band, is set to perform patriotic tunes, rock and country hits and more in advance of the fireworks, the National Park Service says. A Capitol Fourth Concert: U.S. Capitol West Lawn, 8-9:30 p.m. The fireworks will also be preceded by the Capitol Fourth concert, featuring Barry Manilow, Alabama, Nicole Scherzinger, the National Symphony Orchestra and more. Go early for a good spot! Fireworks on the Mall: 9:09-9:27 p.m. Marching bands, fire engines (and of course, fireworks) are all there for your enjoyment at Annapolis City Dock (160 Duke of Gloucester St., Annapolis). The parade will head down West Street starting at 6:30 p.m. Fireworks 9:15 p.m. Hear the live contemporary sounds of the United States Navy Band Cruiser at the Inner Harbor Amphitheater (201 E Pratt St., Baltimore) and let yourself be dazzled by fireworks choreographed to festive music. Music 7 p.m.; fireworks 9:30 p.m.
Bring your lawn chairs and blankets to the University of Maryland (7965 Baltimore Ave.) and cool off as the sun sets with some all-American treats such as hamburgers, hot dogs and more. Fireworks 9 p.m.
Bobby and the Believers will perform for free at the Germantown Soccerplex (18041 Central Park Circle, Boyds), leading up to the fireworks. Music 7 p.m.; fireworks 9:15 p.m.
At Chesapeake Beach (8200 Bayside Road), enjoy some of the most exquisite fireworks in the region, right over the Chesapeake Bay. You'll find a number of vantage points for your viewing pleasure. Fireworks 9:20 p.m. The Columbia Lakefront (10221 Wincopin Circle) is the perfect place for family, fun and fireworks. Stretch out on the lawn and enjoy this lakefront view of the show. Fireworks at dusk. Escape the city and watch fireworks dance in the dark western Maryland sky. Visit Marsh Mountain at Wisp Resort (296 Marsh Hill Road) for this unique viewing experience. Fireworks 9:30 p.m.
Head up for a community drum circle Buddy Attick Lake Park (555 Crescent Road). Bring a picnic, walk the trail, or enjoy the playground; just be sure to find a good viewing spot for the fireworks. Music 5:30 p.m.; fireworks 9 p.m. It's an all-day affair at Granville Gude Park (8300 Mulberry St., Laurel) starting with a parade in the morning and ending with the fireworks at night. And there's plenty of fun in between, including the horseshoe contest and the annual hot dog eating contest, just to name a couple. Parade 9 a.m.; fireworks 9:15 p.m.
Head out to the Ocean City Boardwalk to see eight minutes of red, white and blue lights over the ocean. A free concert will precede the fireworks. Concert 8 p.m.; fireworks 10 p.m.
Six Flags Amusement Park will hold its fireworks shows on Friday, July 3, Saturday, July 4 and Sunday, July 6 at 9:30 p.m.
Mattie J.T. Stepanek Park (King Farm) will showcase three performances on two stages before the fireworks begin, plus an appearance by the Mayor and Council of Rockville. Performances 7-9 p.m.; fireworks 9:15 pm. Get your red, white and blue attire and head to the Solomon's Island river walk at noon to see a parade of boats with patriotic decor. Catch the fireworks when the sun goes down. Parade at noon; fireworks 9:15 p.m.
Take part in this historic event as Takoma Park celebrates its 126th annual Independence Day celebration at Takoma Park Middle School (7611 Piney Branch Road, Silver Spring). Enjoy a marimba band, a gymnastics performance and raffle prizes leading up to the show. Evening events 7 p.m.; fireworks 9:30 p.m. Enjoy the sounds of the United States Air Force Band and the sights of fireworks behind the backdrop of the Air Force Memorial (1 Air Force Memorial Drive). You'll be watching the National Mall's fireworks from a distance at this event, but the view will still be excellent. Concert 8 p.m. It's a joint birthday party for Alexandria and America on Saturday, July 11 at Oronoco Bay Park (100 Madison St.). 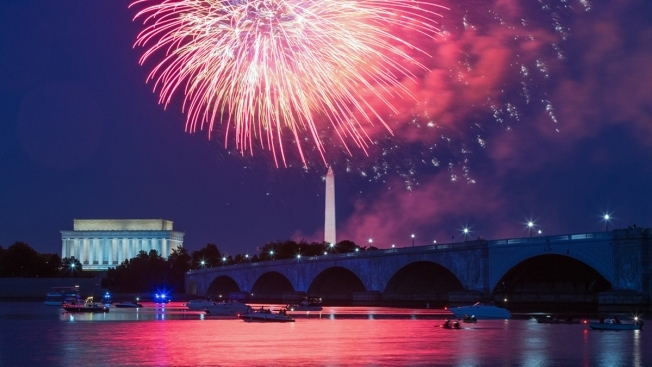 Catch a concert by the Alexandria Symphony Orchestra and a fireworks display. Plus, there will be plenty of birthday cake to go around. Concert 8:30 p.m.; fireworks 9:30 p.m. This July 4 celebration is a full-day affair in Fairfax, starting with an Independence Day parade in the morning and ending with live music and fireworks at Fairfax High School (3501 Rebel Run). Parade 10 a.m.; music 7 p.m.; fireworks 9:30 p.m.
Join the city of Falls Church for an Independence Day party complete with live music and fireworks at George Mason High School (7124 Leesburg Pike).Concert 7 p.m.; fireworks 9:20 p.m. The town of Herndon will ring in America's birthday during a night packed with patriotism, featuring games, face painting, bingo, live music and, of course, a fireworks show. You'll find it all at Bready Park (814 Ferndale Ave.). Games and crafts 7 p.m.; concert 7:15 p.m.; fireworks 9:30 p.m. Throw back to revolutionary times with July 4 in Historic Downtown Leesburg. From a morning parade to a country performance by Harley Boone to a fireworks show, there's plenty to do on Independence Day at Ida Lee Park (60 Ida Lee Drive NW). Parade 10 a.m.; concert 6:30 p.m.; fireworks 9:30 p.m. Celebrate July 4 with an all-American party in downtown Manassas, featuring rides for kids, food vendors, live music and a fireworks display on the historic Manassas Museum lawn (9101 Prince William St.). Rides 3 p.m.; food and live entertainment 4 p.m.; fireworks 9:15 p.m.
Make the holiday sparkle with McLean's fireworks show at Cooper Middle School (977 Balls Hill Road). Shuttle buses will be available from St. John's Lutheran Church (on Douglass Street and Georgetown Pike) and the McLean Community Center. Gates open 8 p.m.; fireworks 9:15 p.m.
Why not meet George and Martha Washington on the Fourth? Mount Vernon (3200 Mount Vernon Memorial Highway), the historic estate of the first first couple, will offer activities all day, including a naturalization ceremony for 100 new citizens, military re-enactments, daytime fireworks and more. Just be warned: This is one event without fireworks. $17 for adults; $9 for kids ages 6-11; free for kids younger than 5. Activities 8 a.m.-5 p.m. Stretch out the festivities by celebrating all day at Lake Fairfax Park (1400 Fairfax Drive) in Reston. Spend the day at the park before the evening fireworks display and a performance by the Hard to Tell Band. Park opens 7 a.m.; carousel and boat rides 11 a.m.; puppet shows 3 p.m.; fireworks 9:15 p.m.
Vienna hosts a two-day celebration on the Third and Fourth. On July 3, you'll find a live concert featuring Fat Chance and a fireworks celebration with spectator seating in Yeonas Park (1319 Ross Drive) and Southside Park (1315 Ross Drive). On July 4, there's a full day celebration including live music, barbecue, moon bounces and a chili dog eating contest at the Vienna Town Green (144 Maple Ave. E.). Festival 12-6 p.m.; concert 7 p.m.; fireworks 9 p.m.
At Colonial Williamsburg, enjoy a reading of the Declaration of Independence, live music and a performance of the musical "1776," all in a patriotic setting. Musical 4 p.m.; fireworks 9:10 p.m.